This is the time of year that many people take to the broom closets and cleaning supplies as they rid their homes of a winter’s-worth of dirt and dust. Yesterday, I spent Easter with the family and did a little bit of cleaning (not deep enough to be called “Spring Cleaning”, but it afforded me a change to take a look at many things I had accumulated. Some of the things I found simply needed to be placed neatly away. Others needed tossing, and still others, unfinished house projects which were at various stages of completion, needed to be places on a schedule for completion. It feels good to go through that stuff and bring order to our crazy lives. Cleaning and taking stock in these things also reminds me to take stock in my writerly life. Last year, I spent a while looking through my old blog posts, and organize them into categories. This year I find myself looking at my other writing output. Like the clutter in my home, I discovered a few poetry pieces that needed to be categorized on my computer for easy access, unfinished short stories and novels, some in the idea-gathering phase, which were put at the forefront of the to-be-done folder, and a few throw-away documents which needed to be cleared from my desktop. I also glanced at my blog posting output, and while I am extremely pleased and gratified by the stuff we talk about on here, my posting schedule has been less than regular lately. There is a reason for that…I’ll be clearing that all up really soon! So in the meantime, I will be working on some unfinished projects trying to continue to clear away some of the writerly clutter. I hope you all enjoy all of the joys that Spring can bring, and as you declutter, you find some gems! Sometimes, out of the blue, we are able to experience a joy that takes us back in time a little bit; back to our childhoods, when magic, friends, and summer camp seem to go hand in hand…in hand. This time, though, I got to take a trip down memory lane with my daughter. Author Pete Catalano asked if I might read his upcoming middle grade release, ARTIFACTS, in exchange for an honest review. As an author, I don’t read or write middle grade at all, but the premise of his story intrigued me; middle school students with their summer camp vacation on the line, must search for artifacts from fairy tales to be displayed in a library exhibit, or else be remanded to summer school! I teach in a middle school, and I could hardly wait to see how the 6th graders in Mr. Catalano’s book fared in their quest. This book provided an opportunity to read something brand new with my school aged daughter, and let me tell you, she loved it! In ARTIFACTS, Mr. Catalano creates vivid characters, and places them in wildly imaginative settings as he weaves the tale from start to finish. You will find yourself rooting for Jax, Korie, Crunch, Mouth and Tank (Great names!) as they battle fairy tale villains from the past in search of the artifacts. I was impressed with how Mr. Catalano was able to create the hysterical sarcasm that is the trademark middle school wit. Trust me, I know! I hear it every day! This was a really fun read. It is creatively written, and absolutely cracked my daughter up in several points, to the point of hiccups! I’ll be recommending it to my school’s library, as well. I really enjoyed reading this with my daughter, and I know that others will enjoy reading it, too. My only wish would be that there were illustrations to begin each chapter. Pete Catalano’s writing is so vivid in some scenes! But then again, I enjoyed letting my imagination paint the pictures. I look forward to more from this author. 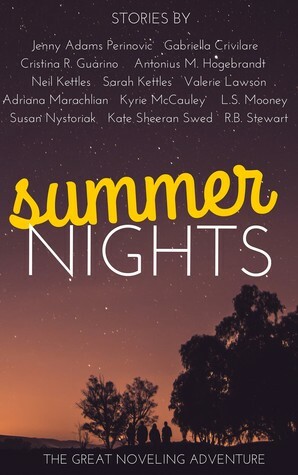 I just wanted to take a moment to share the anthology I have a short story in, SUMMER NIGHTS. If you get a chance, take a peek at it over at Amazon, as well as other retailers. It’s a free download, and you’ll get to read some flash fiction where every story is less than 1000 words. David Bowie has passed away, and I’m saddened. Growing up in the 80’s, I would listen to his infectious music often. His Album, “Let’s Dance” was one of the first that I ordered through my Columbia House Tape Club. Remember that? Twelve tapes for a penny! Listening to his music put a beat I’m my step and a song in my heart. I know it sounds corny, but still, the sentiment is true. I could always pop one of his tapes into my Walkman, and escape. I’m going grab a fresh set of double A batteries, slide one of his greatest hits tapes in right now, and take a trip down memory Lane with David Bowie. Ooh!! Next up is Under Pressure! Fantastic! Queen and David Bowie was magic! And then, years later, when Vanilla Ice came under fire for the amazing similarity of Ice Ice Baby’s hook to this original tune. Do you remember? Ugh! I’m running low on batteries again. (Anyone else have those memories? The power light on the Walkman always seemed to begin to fade too fast!) Time for one more fave! Here’s Let’s Dance! Bowie’s music has stood the test of time, with its recognizable vibe and melodic ambition, spanning across the decades. So, while David Bowie has left us, his words and music will live on in my Walkman, and on YouTube. Do you have any David Bowie memories? Share them in the comments!